Dough needs to rise sufficiently in order to make bread that's light and airy rather than heavy and tough. A leavening agent is responsible for making dough rise by creating air pockets inside. For quick rising, you need the optimal environment for air pockets to form. Using a leavening agent helps dough rise faster. 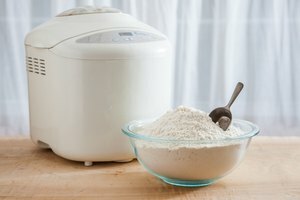 While baking soda and baking powder are most often used in cakes and quick breads, yeast is the main leavening agent used in bread and pizza dough. All three cause chemical reactions to create gas that forms air pockets. Some yeast, commonly known as "rapid rise," has been engineered to activate the chemical reaction faster. Some types of flour, like self-rising, already contain a leavening agent. Most leavening agents cause dough to rise gradually at room temperature. In moister dough, warmer ambient temperature speeds up the process. For faster rising, place dough over a pan of warm water in a warm oven; or microwave once or twice on low power for up to 25 seconds. However, keep dough below 250 degrees Fahrenheit, or else it will begin to cook. 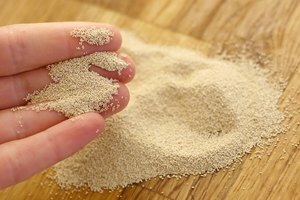 Active dry yeast is a living organism that goes dormant during storage. To "proof" or activate it, add it to warm water, about 110 to 115 degrees Fahrenheit. Water above about 125 degrees Fahrenheit can kill the yeast, so test it first; it should feel hot but comfortable enough to put your finger in. To speed up the proofing, add a pinch of sugar to the warm water. The yeast feeds on the sugar and produces carbon dioxide gas more quickly. Vinegar creates a similar reaction. Add 3/4 teaspoon apple cider vinegar or balsamic vinegar for every 3 cups flour when mixing the dough. Let the dough rise to double size in a warm location, or cover and put the dough next to a cup of hot water in the microwave and heat on low for up to 3 minutes. Let the dough rest for 3 minutes, then heat again. As carbon dioxide forms, the dough expands. If the surface of the dough dries out, the crust that forms will keep it from rising as quickly. To let the dough rise freely, lightly coat the top with vegetable oil and cover with plastic wrap or a moist towel. 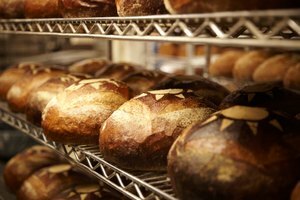 Whats4Eats: Does Sugar Help Bread Yeast Grow? General Chemistry Online: What Happens When Sodium Bicarbonate Is Heated?